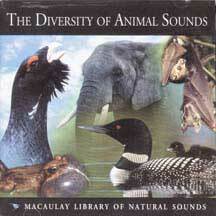 Cover of the CD "The Diversity of Animal Sounds"
The first few tracks of The Diversity of Animal Sounds take me from the enthusiastic song of a male satin bowerbird in Australia to the deep-toned, primordial growls of the American alligator to the unabashed mating grunts of a jaguar. I am amused, and then deliciously frightened, and finally, slightly embarrassed - I keep the volume down on the jaguar track. Produced by the Cornell Laboratory of Ornithology from its Macaulay Library of Natural Sounds, this new CD comes with a 28-page guide to such sounds as the bugling of elk, the abdomen-thrumming of insects, the pant-hoots of chimpanzees, and the ghostly wailing of loons. The booklet also explains how animal anatomy, habitat and species dispersion affect communication. Without a single human voice to break the cacophony, this collection of 62 animal sounds captures the enchanting lure of a natural world all too few of us get to experience. The CD is available online at www.birdscornell.edu, or call Wild Birds Unlimited at 877/266-4928, or the American Birding Association at 800/634-7736.